what will u be watching? All #SEAGames2015 tickets to netball game between #OurTeamSG and Malaysia on June 2 are sold out. I only watch Olympic. Next year Olympic 2016 going to be at Brazil. first ever GOLD from the sync swimmers! Singapore Gold or Singaporean SHAME? #SEAGames2015: SHOCK defeat in women's singles - Singapore's Feng Tianwei eliminated by Sawettabut Suthasini of #Thailand 3-1. 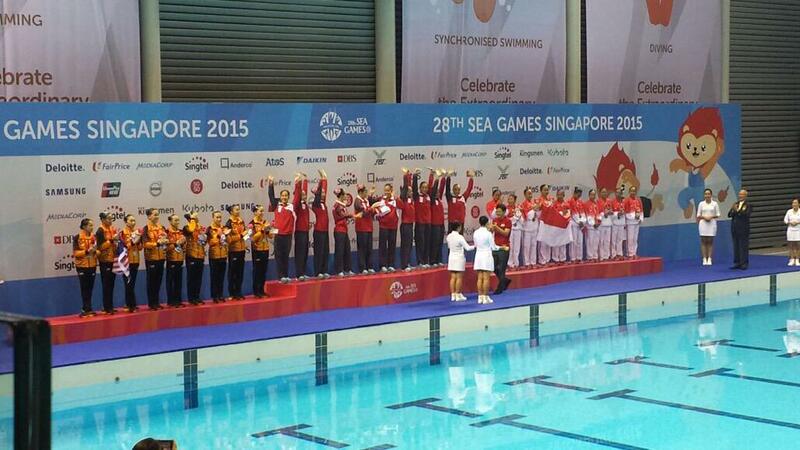 Singapore synchro duo Stephanie Chen, Crystal Yap miss out on gold. SEPAK TAKRAW: Singapore wins joint-bronze in Chinlone Linking. Equestrian: Singapore rides to silver in Dressage Team. SINGAPORE - Former MediaCorp actress Sharon Au has apologised for her attempt at mimicking an Indian accent during Friday night's SEA Games opening ceremony pre-show at the National Stadium. Au, who shared hosting duties with actor Chua Enlai and television presenter Nikki Muller, wrote on her personal Facebook page on Saturday morning: "It was intended to be comic but in hindsight I realise how insensitive it was. I sincerely apologise to those whom I've inadvertently offended." Agence France-Presse (AFP) journalist Bhavan Jaipragas had accused Au of putting on a strong Indian accent to mock a young Indian girl sitting in the stands. He also said Au made fun of the girl's name. Jaipragas detailed the controversial incident in a Facebook post on Friday evening, in which he called on Au and the organising committee to apologise. "In an audience interaction segment before the start of the SEA Games opening ceremony at the National Stadium, emcee Sharon Au approached an Indian girl seated in the stands. The girl did not properly perform the act - saying aloud a line welcoming foreign contingents (others before her didn't get it right too). Au, speaking into a mike and with the cameras trained on her, shockingly put on a strong Indian accent, and while shaking her head from right to left asked the girl: "What (Vat) happened? What happened?" he wrote. Au had taken a step back from the acting and hosting limelight since returning from her overseas studies in 2011 to take up an executive position at MediaCorp. SINGAPORE: A power outage at SAFRA Yishun disrupted a SEA Games shooting competition on Saturday morning (Jun 6). Lights went out and the air-conditioner stopped working at about 11am, as the men's 10m air rifle qualification event was taking place. Power was restored about 15 minutes later. Officials are still investigating the cause of the incident. The Singapore team, comprising Royce Chan, Wesley Leong and Wong Ting Wei, finished fourth in the five-team competition, with Vietnam beating the hosts to the bronze medal by 0.7 points. Thailand won the gold medal while Malaysia took silver. Traditional Boat Race: Singapore's 6-man crew takes bronze in men's 200m event.